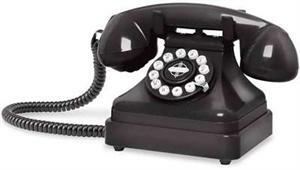 Our Kettle Classic Desk Phone captures the essence of the classic 1930's European-style telephone. This beauty was originally cast in a heavy-duty metal and then later reconditioned in a lightweight thermoplastic, giving it a more stylistic approach and curved design. The Kettle Classic Desk Phone successfully combines industrial technology with design-inspired craftsmanship right down to the classic cloth cord. This "fat style" phone features a substantial "hoof." 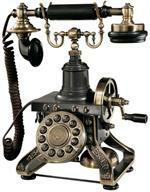 True to the original, it also incorporates a mechanical bell in the base.